I had the opportunity this past week to visit the Museum of Westward Expansion which is part of the Jefferson National Expansion Memorial and is housed underground beneath the Gateway Arch in St. Louis. According to the museum’s website it “preserves some of the rarest artifacts from the days of Lewis and Clark” and allows visitors to “explore the world of American Indians and the 19th-century pioneers who helped shape the history of the American West.” Imagine my surprise then when I came across the floor to ceiling photograph shown below in the middle of the first exhibit room dedicated to a timeline of the Lewis and Clark expedition. You will of course recognize it as the iconic image of the “mushroom cloud” explosion over Nagasaki, the second of two atomic bombs dropped on Japan in August, 1945. Since this event has no obvious connection to the Louis and Clark Expedition, I expressed my surprise to one of the museum’s docents who responded by noting, “… the museum is [also] about the advance of civilization as part of the nation’s movement westward and we want to show some of the key moments from the twentieth century.” And indeed, not far from this display one finds a comparable floor to ceiling photograph of Neil Armstrong saluting the U.S. flag on the moon. In as much as the space program was originally framed as an extension of the American frontier—marked here by the stage coach—the photograph of the moon landing makes a modicum of sense, but the explosion of a bomb that obliterated a city killing nearly forty thousand people and set off what became known as the Cold War’s “arms race” does not sit easily with the theme of the “advance of civilization,” and its connection to the notion of “westward expansion” is even more difficult to fathom. 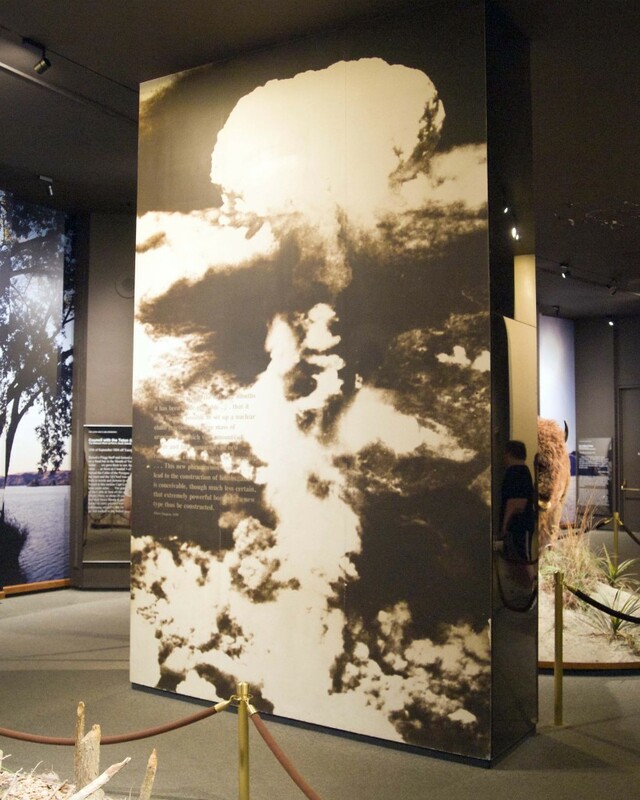 Upon more careful inspection, however, I noticed that the photograph of the mushroom cloud, which otherwise lacked any caption or explanation, is inscribed with a quotation from Alfred Einstein in 1939 that reads: “… in the course of the last four months it has been made probable … that it may become possible to set up a nuclear chain reaction in a large mass of uranium by which vast amounts of power and large quantities of new radium elements would be generated … This new phenomenon … would lead to the production of bombs and it is conceivable, though much less certain, that extremely powerful bombs of a new type constructed.” The quotation stands in odd opposition to the photograph itself inasmuch as it frames the bomb as a less than certain outcome of a scientific advance in nuclear technology. The bomb may have been “much less certain,” but sure enough here it is as a documented, photographic reality. One might want to read this as a ham handed expression of America’s “manifest destiny,” and I don’t want to ignore the implications of that possibility. But I think there is another and more subtle point to be made. Einstein’s words precede the explosion by six years. And as such they caption the image in terms of what Hariman and I have described elsewhere as “modernity’s gamble,” the wager that the long-term dangers (and anxieties) of a technology-intensive society will be avoided (or managed) by continued progress. Yes, the ability to “set up a nuclear chain reaction” is a mark of scientific and technological progress, but of course it comes with a risk—the possibility of the production of “extremely powerful bombs of a new type.” That in this case the possibility became a catastrophic reality is mitigated by the necessities of the gamble itself, i.e., such risk is the cost of progress in an advanced technological society. And as the second photograph purports to show, sometimes the gamble pays off. The problem, of course, is that those who paid the costs of such gambles with their lives are nowhere to be seen in either photograph. 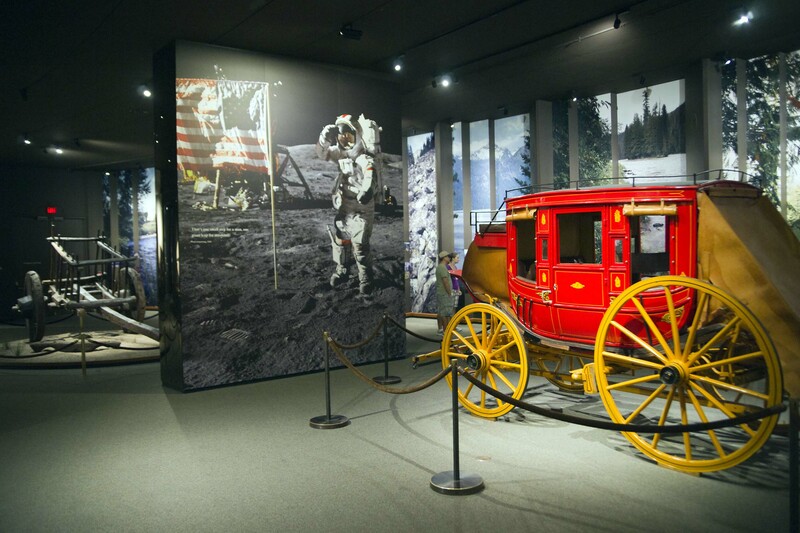 In short, the exhibit articulates our history of westward expansion with our cultural vow to technological progress, and as such it reinforces our commitment to the rationale of modernity’s gamble. More specifically, it contributes to the domestication of our memory and understanding of the explosion of the bombs over Hiroshima and Nagasaki by casting them as simple “advances in civilization.” And that should give us pause.